Channel delays: DFDS Newhaven-Dieppe, strike warning, service 13 December may be cancelled. Weather alerts: Red alert for high winds Sweden, Norway and Finland. Also yellow for fog Germany and Italy. Weather: Usual early fog. Heavy snow Turkey. Mostly settled. Cold. 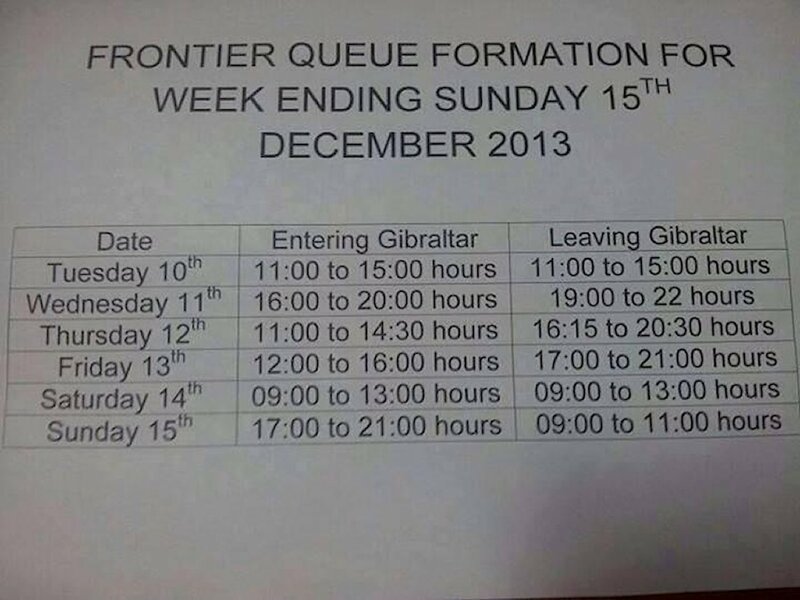 LEAKED GIBRALTAR FRONTIER ROTA BELIES SPORADIC CLAIMS. GIBRALTAR. Guardia Civil border guards deny that this English translation of this week’s rota circulating on social media is genuine, but according to www.GBC.gi it bears a remarkable resemblance to the actual shifts worked so far. Queues have reached 3h30 this week. Spain maintains that the ongoing and extremely lengthy ‘enhanced’ checks at the Gibraltar frontier are random and sporadic. Meanwhile, there is reported strife between local Guardia Civil officers and their ‘heavy handed’ colleagues – dubbed ‘boinas’ – drafted in from nearby Algeciras. Update 15.12.13: bearing in mind the phrase ‘all’s fair in love and war’ it’s wise not to get carried away. However, queues have continued to conform to the rota with delays of two hours until late morning today.. Follow @RGPolice or see www.frontierqueue.gi for more. SERBIA/BULGARIA: New road effort Nis-Sofia. Western Europe to the Black Sea by mid-2016? The 160km Corridor X motorway between Nis and Sofia will open in mid-2016 said Serbian Prime Minister Ivica Dacic after a meeting with Bulgarian President Rossen Plevneliev in Sofia yesterday. Thus the Bulgarian capital will be connected to the European motorway network for the first time, as will the Black Sea. Work is on-going on the Serb section with officials boasting this week of their 58.1km/year construction rate, far above the European average of 52km/year. The Sofia ring road will have to be completed before the Bulgarians start their stretch but at just 40km over easy terrain it is expected to be a straightforward job. Meanwhile, China’s Shandong Hi-Speed will start construction on the vital central section of the Corridor XI Belgrade-Bar (Montenegro) motorway by the end of the year. The 40 mile Obrenovac-Ljig stretch has a build time of 37 months. Two other Chinese companies, CCCC and CRBC, begin work on the Montenegro section in February 2014, fingers crossed, the third start date so far. The 80 mile section Bar-Boljar, straight through mountains – widely described as the most important highway in Montenegro – will cost in excess of €2bn, financed by Chinese banks. Ultimately, Corridor XI will link the Adriatic Sea with the Black Sea via Podgorica, Belgrade and Bucharest. 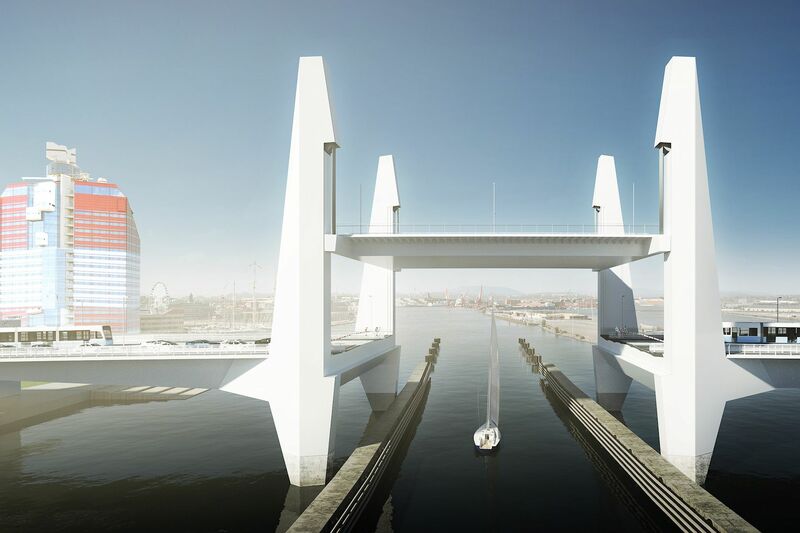 Arpeggio: Oresund Link architects Dissing+Weitling have beaten off stiff international competition to design the new bridge in central Gothenburg, a structure expected to become an icon of Sweden’s second city. Also in competition were Zaha Hadid Architects, Snohetta and Wilkinson Eyre. Built to replace the existing 75 year old steel bridge on Gothenburg’s waterfront – beside the red and white Lapstiftet (Lipstick) tower and the new Opera House – the new crossing features a central lifting spar which rises 30m, and opposing towers said to nod to each other. Arpeggio is not part of the Vastsvenskapaketet, the major overhaul of transport in the west Sweden region partly dependent on funding from Gothenburg’s highly controversial new congestion zone (and which includes paying for a new tunnel under the Gota River in the city centre). Set to be decided in a referendum next September, the congestion zone is still opposed by the majority of Gothenburgers though a recent survey suggests support is growing. BELARUS. More roads are to be added into the electronic road toll scheme, in two phases. From 1 January the entire M4 Minsk-Mogilev highway will be chargeable. Exactly which roads will be tolled from 1 July 2014 depends on upgrades but is almost certain to include M5 Minsk-Gomel (see map). Tolls apply to all non-CIS vehicles. For more info see www.BelToll.by. Meanwhile, authorities are working on a simplified toll scheme for drivers attending the 2014 Ice Hockey World Championships in Minsk in May 2014. Spectators have already been exempted from needing a visa. More details soon. UZBEKISTAN. An easier route south from Samarkand to the Afghan border, avoiding the foothills of the Tian Shan mountain range, should be up and running within two years. A tender to upgrade the 43 mile P87 Kukdala-Chim-Guzar to four lane highway was issued today with finance from Saudi Arabia and Kuwait.